Wow, I’m cutting it close submitting this. 2 hours til the deadline! Anyway, this was extremely frustrating for me to do, but here I bring you my somewhat-sloppy entry for Nintendo's Splatoon Fan Art contest! There was a lot more I wish I could do with it, but I decided not to due to layer problems and such. 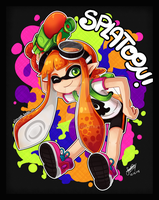 It has a very large impact on squids and their lives and how they live and how they are fresh and how they like splatoon and how they are playing splatoon but they are holding the games in their hands but their in the game but how are they holding the game in their hand if they are the game? Also it features: kawaii shrimp, mad clownfish, peace cats, squids, and squid tentacles. But what I don't understand is why is annie (the hat shopkeeper) happy? She is always extremely reserved and constantly ruminating. Also a fun fact, Annie and Moe's combined names are a pun of the word "anemone," as their names sound like the "ane" and "mo" in anemone respectively. I'm pretty sure this idiot stole your art. Oh, looks as though it's been removed, but thank you very much for letting me know! no problem. I just don't like art theft. I love it! Nice work bro! Fun-looking game with awful advertising!